Digital printing uses toners (the toner is fused/melted onto the paper), inkjet heads (small droplets of ink are dotted onto the paper) or laser printing (which uses an electrostatic plate). Digital printing is great for smaller print runs and where there is variation in what is being printed; think about advertising mailers with individual names and addresses. This means digital is a fast and cost-effective way of printing individualised projects, large or small. The print quality of toner and inkjet digital printing may not be as professional as web offset or sheet fed but advances in technology have meant digital print quality is improving all the time. Currently, HP Indigo printing presses offer the highest quality digital printing. Unlike other digital printers, HP Indigo printers use a Photo Imaging Plate (PIP) which is dynamic and can be changed with every revolution of the plate because the ink is attracted to the light sensitive plate by electrostatic charge. This means that it offers high print quality and the flexibility to continuously change the colours and image. Sheet fed printing is good for heavier paper and will allow for additional spot colours and varnishes to be applied (e.g. pantone or gold detailing) which makes it perfect for printing covers. Despite its name, sheet fed can use paper reels (cut-star) and sheets and lends itself to volume printing such as leaflets and brochures using paper weights over 115gsm. In comparison, there is typically less waste generated than there would be if using the web offset printing process. Because the ink is not heatset on the paper, the ink oxidises to bind into the paper to give a more matt finish than in heatset web offset. 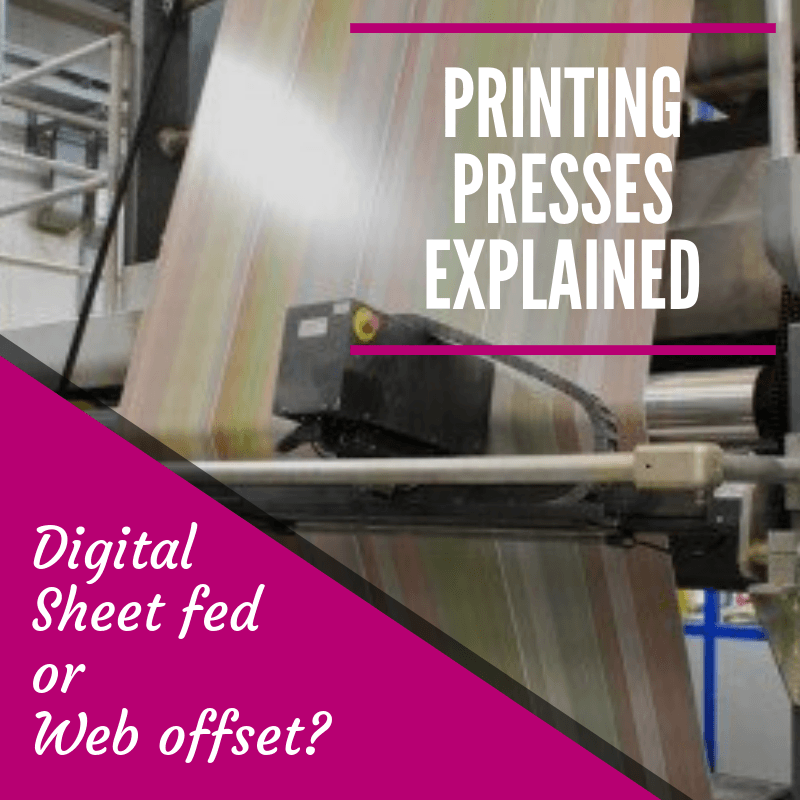 Also, because in sheet fed printing each part of the process is independent, printer issues don’t hamper cutting or binding which can be the case for web offset printing. Web offset printing is a fast and economical print process for high volume or high pagination print products such as magazines, direct mail catalogues and holiday brochures. Web offset printers are great for larger print runs or higher paginations because the printing and folding happens in-line. Web offset presses can be configured to produce press finished (trimmed and bound) magazines or catalogues. Typically these press finished products tend to be using a lighter weight (sub 70gsm) paper stock. Heatset web offset uses an oven to dry the ink on the paper as it is printed, which creates a glossy finish because the ink isn’t absorbed into the paper. The heat can cause the paper to flute or ripple slightly and web growth can occur after the paper has been cut to size. Web growth happens over a period of time, occurring as moisture is reabsorbed by the heatset printed paper . This can lead to the paper expanding slightly in comparison to a sheetfed printed cover. In coldset web offset the ink is fixed as it is absorbed into the uncoated newsprint paper. Coldset web offset is typically for newspapers. Whether you are looking for catalogue printing, brochure printing or a professional magazine printer we can advise you on which options will provide the quality and pricing you require.